With a babka renaissance in full swing, there’s no better time to ask, what is babka? To start, it’s a dense bread that’s swirled with chocolate or cinnamon and often topped with nuggets of cinnamon-sugar streusel. Until recently, it could only be found in Jewish or Eastern European bakeries and the occasional grocery store. Now, though, we’re seeing babka (and creative adaptations of it!) in cafes, bakeries, and food blogs everywhere. Even Trader Joe’s sells babka! Perhaps what makes babka so irresistible is the contrast between the slightly-dry layers of bread and the sticky, delicious swirls of chocolate spread. Because it manages to be both light and dense at once, it’s difficult to stop at just one slice! And while it’s perfect alongside coffee, it’s by no means limited to morning consumption and can be all-too-easily noshed on as an afternoon snack or dessert. Babka’s history is as rich and interwoven as the swirls in its dough. Ari Weinzweig’s illuminating history of babka reveals that babka, which means “little grandmother” in Ukranian, Russian, and Eastern European Yiddish, has always been popular where those languages are spoken. On Shabbat, grandmothers would twist leftover scraps of challah with seeds and nuts, forming something delicious but far less sweet than the babkas we see today. This version of babka existed alongside other Polish babkas, which were baked in taller round, fluted pans. It wasn’t until Eastern European Jews arrived in New York that chocolate was added to the mix. There, chocolate was affordable and easy to find, and it was thus discovered that finely-chopped dark chocolate made for a rich and tasty babka. 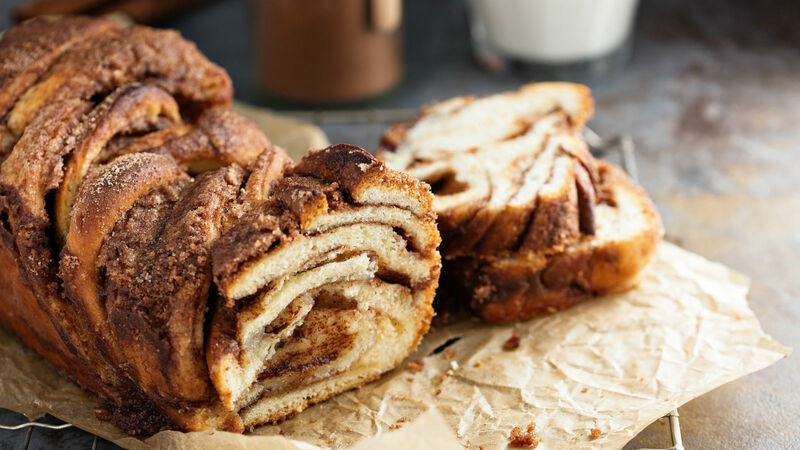 Cinnamon and often almond paste, too, were spread onto a layer of dough, which was tightly rolled, twisted and folded, and baked into the rich loaves we know and love today.